Gorgeous Malshipoo Puppies If you see one you love and it says STILL AVAILABLE scroll past past the puppies till you come to their page to learn more about them. SOLD! 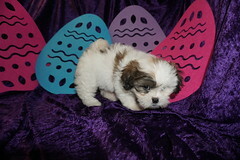 Ruby Gorgeous Female CKC Malshipoo Brindle With White Markings! What a beautiful little girl. She has beautiful brindle color and the cutest baby doll face. She has such a soft lush coat. She loves to prance around and show off. She enjoys playing with the kids and being outside. She’s a very sweet loving dogs and love everyone. She’s easygoing and smart. Here is the girl for you. Call today and she can be your very own. She is a real sweetheart and will give you many years of happiness and love. Call today. My new name is Delilah and my new home is Jacksonville, FL. Ruby is the only one in her litter so she knows she;s momma favorite! She is so adorable just look her absolutely gorgeous color of brindle that will probably turn lighter over the next few weeks. Don’t forget her gorgeous full tail. She is not only beautiful but her personality makes her such a wonderful puppy! Don’t take to long to decide she won’t last long! Estimated adult weight 9 – 10 lbs. SOLD! Mitzi Gorgeous Female CKC Malshipoo Black with Curls & She Has Her Tail! Molly is a very happy little girl who likes to cuddle. She also likes to explore and play with her toys. She is very sweet and loving, and is ready to complete any family. She knows how to light up your day with her little puppy kisses. Molly is a precious little girl with a very sweet disposition and is outgoing and loves everyone she meets. She also loves to give kisses!. Molly has been around people of all ages and does great with people of all ages. Molly has had the very best start in life. She will come to you healthy, happy, and a tiny bit spoiled. So what are you waiting for call to day because Molly can’t wait to meet her new family! My new name is Zoey and my new home is Palm Coast, FL. Molly is the one of three females in this litter of three and what a cutie pie she is! She is so adorable just look her absolutely gorgeous buff color with a pinch of white on her chin (I’m almost positive she will be a beautiful silver gray like her mommy). She is a solid color with curls already forming and she has her full tail. She is not only beautiful but her personality makes her such a wonderful puppy! Don’t take to long to decide she won’t last long! Estimated adult weight 7-9 lbs. Waiting on my new name and my new home is Fresno, CA. Milly is the one of three females in this litter of three and what a cutie pie she is! She is so adorable just look her absolutely gorgeous color of black of black but seeing her gray nose I’m almost positive she will be a beautiful silver gray like her mommy. She is a sold color with curls already forming and the cutest docked tail. She is not only beautiful but her personality makes her such a wonderful puppy! Don’t take to long to decide she won’t last long! Estimated adult weight 7-9 lbs. SOLD! Bandito Gorgeous Male CKC Malshipoo Smallest of His Litter But Biggest Heart Of Love! Look no further! You have found your new baby boy. Bandito is exactly what you have been looking for, perfect in every way. He loves to stay right with you play or loving and he is always up for movie-time. He is just waiting for that perfect family to make him theirs. Oh did I mention he is the smallest of his litter just as the saying goes big things come in small packages so be ready for the love of your life. Don’t miss out on this handsome baby boy. What are you waiting for? Make this cuddle bug yours today. My new name is Dice and my new home is Clearwater, FL. Bandito is the one of four males in this litter of five and the smallest of his litter. You couldn’t ask for a cuter one at that so don’t take to long to decide or he might just slip through your fingers! He is so adorable with his black and white coloring. Just look at his teddy bear faceand yes this breed has their tail. Don’t take to long to decide he won’t last long! SOLD! Mr. Bojangles Male CKC Malshipoo So Adorable How Can You Say No? Waiting on my new name and my new home is Callahan FL. Bojangles is the one of four males in this litter of five and you couldn’t ask for a cuter one at that! He is so adorable. Just look at his teddy bear face and he appears to have a tri color brindle white coloring and yes this breed has their tail. Don’t take to long to decide he won’t last long! SOLD! Buffy Cutest Female CKC Malshipoo Says I’m The Only Girl In This Litter Of Five! My new name is Fraggle and my new home is Orlando, FL. Buffy is the only female in this litter of five and you couldn’t ask for a sweeter more love one at that! She is so adorable just look at her baby doll face and her black white coloring Her face has the most black with a little white then her body has the most white with a little black, she is just a living doll to say the least. Yes this breed has their tail. Don’t take to long to decide she won’t last long! SOLD! 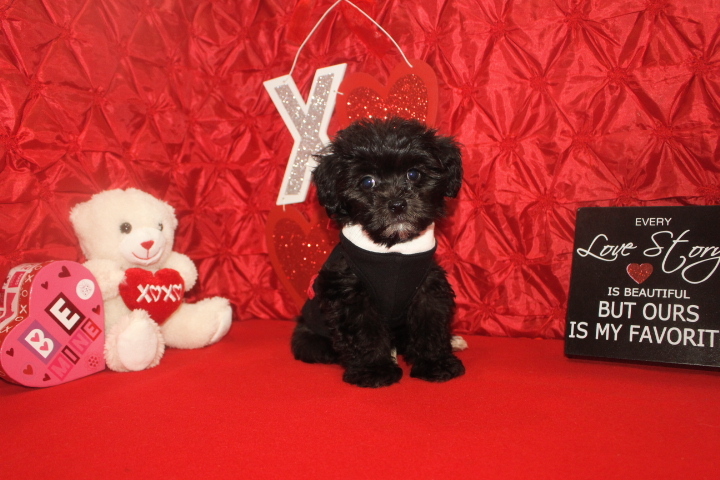 Bouncer Cutest Male CKC Malshipoo He Is Ready To Bounce Right Into Heart! Meet Bouncer! He is just the sweetest baby boy you will ever meet, and comes with good manners. Bouncer will be a very loyal companion to his new forever family and will come home to you with a lifetime of puppy kisses. He hopes you love to cuddle and take a nap after a long day of fun because he wants to be your cuddle bug. Don’t miss out on this pup. His bags are packed and he’s ready to go! BOUNCER is the one of four males in this litter of five and you couldn’t ask for a cuter one at that! He is the one with the most color on his body and the brindle red making him so adorable. Just look at his teddy bear face and yes this breed has their tail. Don’t take to long to decide he won’t last long! SOLD! Buckaroo Gorgeous Male CKC Malshipoo Says Pick Me and Let The Fun Begin! Meet Buckaroo! This little guy is ready to add some fun and love into his fur-ever home! He is such a sweet, loving, and baby boy and so adorable looking. He’s sure to make all your dreams come true! Buckaroo can’t wait to meet his new family. Once you see this cutie, it will be love at first sight. Just look at that precious face! Who could ever say no to him? Buckaroo will arrive with plenty of puppy kisses for the whole family. Get ready for a mess of fun with this great boy at your side! Waiting on my new name and my new home is Austin, TX. Buckaroo is the one of four males in this litter of five and you couldn’t ask for a cuter one at that! He is so adorable. Just look at his teddy bear face and his gorgeous brindle white coloring and yes this breed has their tail. Don’t take to long to decide he won’t last long! SOLD! Maxamillion Gorgeous White with Cream Marking Male CKC Malshipoo He Has It All Looks & Personality! Meet Maxamillion he looks like a million bucks and is so sweet you will wonder how you ever got a long without him.He is as handsome and dashing as they come, this little guy goes right for the heartstrings. He loves to play but still likes cuddling and giving kisses. This bundle of charm comes with a lifetime of puppy kisses for the whole family He has been raised around people of all ages, and is a very social little guy. He is the only one in his litter so don’t let him get away call today. My new name is Cooper and my new home is Jupiter, Florida . What a gorgeous little guy. He has been prayed over for finding his forever home . Maxamillion is the one in this litter and you couldn’t ask for a cuter one at that! He is so gorgeous just look at his gorgeous White body and cream markings on his adorable face and on his back. Don’t take to long to decide he won’t last long! If you see a Malshipoo Puppy below and it still says STILL AVAILABLE then scroll down further till you come to that puppy page. SOLD! 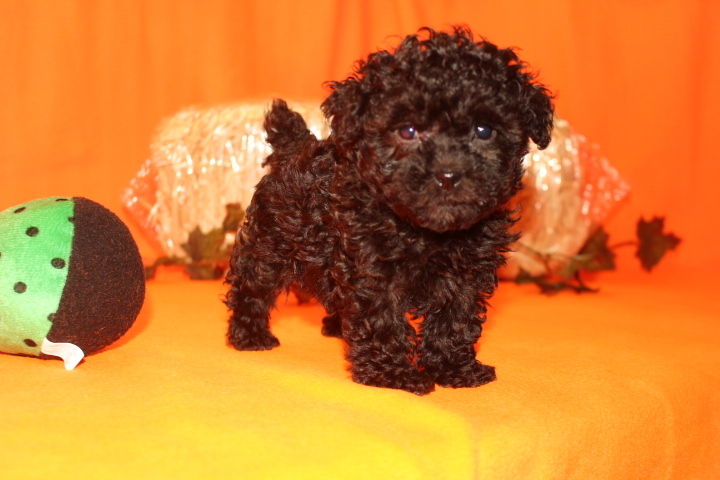 Alvin Gorgeous Apricot Male CKC Malshipoo Ready To Love You! Meet Alvin! This little guy is a very sweet, loving, and gentle baby. He’s sure to make all your dreams come true! Alvin is a sweet and playful boy that can’t wait to meet his new family. Once you see this cutie, it will be love at first sight. Just look at that precious face! Who could ever say no to him? Alvin will arrive with plenty of puppy kisses for the whole family. Get ready for a mess of fun with this great boy at your side! My new name is Happy and my new home is Jacksonville, FL. Alvin is the one of three males in this litter of five and you couldn’t ask for a cuter one at that! He is the only apricot in this litter and he is so beautiful. Just look at his teddy bear face and adorable docked tail. Don’t take to long to decide he won’t last long! Asia is as an adorable black beauty with silver coming in on her face and two back paws tipped in white. She is the true friend you’ve been looking for. She can’t wait to be cuddled in your arms for naps or playing with you outside on those bright, sunny days. You can depend on Asia to put a smile on your face every morning when you wake up to her. She has an amazing personality and loves to cuddle. 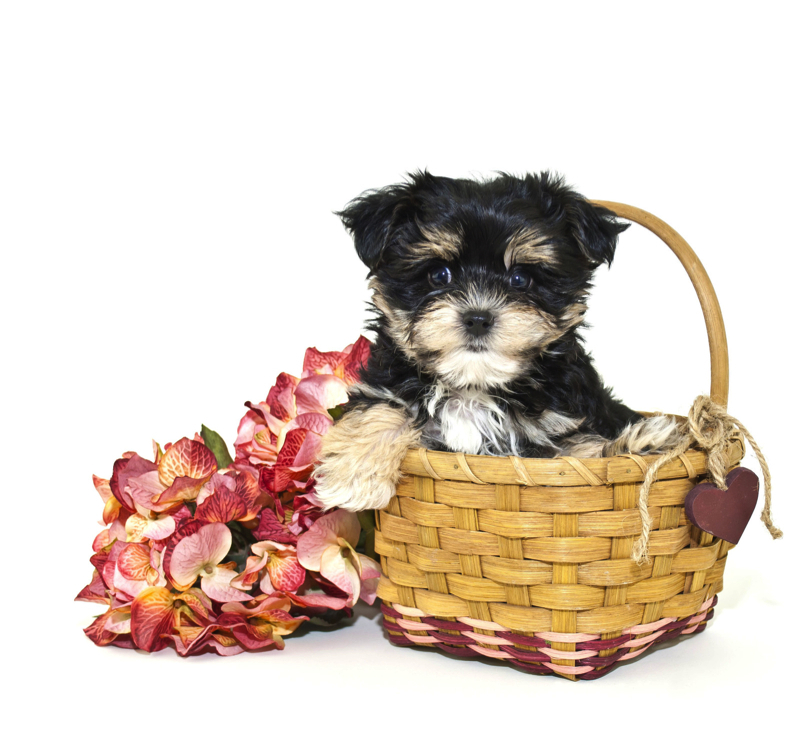 She is full of puppy love that she wants to share with you! Asia says, “Let’s make some great memories together!” Act now before you miss out on this little girl. Waiting on my new name and my new home is Greer, SC. Asia is the one of two females in this litter of five and you couldn’t ask for a cuter one at that! She is so beautiful with his rich black silky hair blue tint coming in on her face and white back paws and don’t forget her tail making her so gorgeous! Don’t take to long to decide she won’t last long! OMG is that really you looking at me? My name is Ace! Your search is over because I promise to be your very best friend and be the best company you have ever had. I am a classic guy! Everyone will love petting his soft coat! I have a wonderful temperament and shows it with his calm and peaceful nature. I love to play, but am the happiest just being with you. I can’t wait to be by your side as your lifelong companion. If you want to class up your life, just pick me! Ace is the one of three males in this litter of five and you couldn’t ask for a cuter one at that! He has a beautiful brindle gold coat that is non shedding and the cutest white paws and his face has gorgeous white markings. Don’t forget his gorgeous tail with a tiny white tip. Don’t take to long to decide he won’t last long! We are pleased to introduce you to Abby. This beautiful girl is on her way to becoming a wonderful dog, just like her parents. Abby is filled with energy and can play with the best of them. She is an explorer at heart and will investigate everything she happens upon. Her affectionate nature is contagious and soon you will find yourself rolling around on the ground with this puppy being covered in puppy kisses. Doesn’t that sound like a dream come true? Call about Abby today! Abby is the one of two females in this litter of five and you couldn’t ask for a cuter one at that! She is so beautiful with his rich black silky hair blue tint coming in on her face and white back paws and don’t forget her tail making her so gorgeous! Don’t take to long to decide she won’t last long! Waiting on my new name and my new home is Palatka, FL. Abe is the one of three males in this litter of five and you couldn’t ask for a cuter one at that! He is so beautiful with his rich black silky hair with white markings just a smidgen of white on chin and his back paws and don’t forget his adorable docked tail making him absolutely gorgeous! Don’t take to long to decide he won’t last long! OMG! Banjo will positively whisk you into the upper stratosphere and drop you over the rainbow. This young pup might be tiny but he packs a punch that will leave you breathless. He comes with pre-training knowing barking is rude using a potty tray and no night crying making him the perfect pick for your family. Don’t wait too long, or his winds just might blow in another direction. What a gorgeous baby boy. He has been prayed over for finding his forever home . Banjo is the tiniest of the two boys in this litter of six and he is so adorable! He is so beautiful just look he is absolutely gorgeous rich black silky hair and just a spot of white on his chin chest and left back paw may show or not as he is an adult time will tell! Don’t take to long to decide he won’t last long! Bandit is the sweetest puppy of his litter. He will be waiting for you to arrive home and welcome you with so much love and then at the end of the day will be ready to snuggle and cuddle! This little guy will be sure to steal your heart away with just one look into those puppy eyes. Bandit is as sweet as they come. He will be that perfect cuddle buddy you have been looking for. He is always the first to want to lay right up with you when it’s movie and popcorn time. He will be sure to come home to you with pre-training, up to date on his puppy vaccinations and a true nose to tail vet check. Don’t let this little cuddlebug pass you by. He is just waiting for you to make him your forever baby boy. Waiting on my new name and my new home is Monticello, FL. Bandit is so adorable you just have to ask yourself how you can leave him behind! He is so beautiful just look he is absolutely gorgeous with his rich black silky hair and hint of chocolate color then just a spot on his chin chest and both back paws may show or not as he is an adult time will tell! Don’t take to long to decide he won’t last long! Meet Scooter, who is absolutely gorgeous in person, with his beautiful, silky chocolate, black color with white marks on back paws and chin. This baby has personality plus. Scooter will make a wonderful, loving family member, and is waiting for that perfect family to shower with his puppy kisses and his loyalty. You can’t help but fall in love with him when you bring him home. Don’t miss out on this lovable, handsome baby boy. Scooter is ready to go, so make your home that much better by bringing him to yours today! Waiting on my new name and my new home is Westcliffe, CO.
Scooter is the one of two boys in this litter of four and he is so adorable! He is so beautiful just look he is absolutely gorgeous with his rich black silky hair and a hint of chocolate color then just a spot on his chin chest and both back paws may show or not as he is an adult time will tell! Don’t take to long to decide he won’t last long!